3 High Quality D type Hander. 5 Useage: Swimming Pool, Beach, Water Park, Lake, River, Shoaling Water, Advertising Display, Ect. 6 I ncluded: Zipper Oil,20M rope storage bag, and instructions. 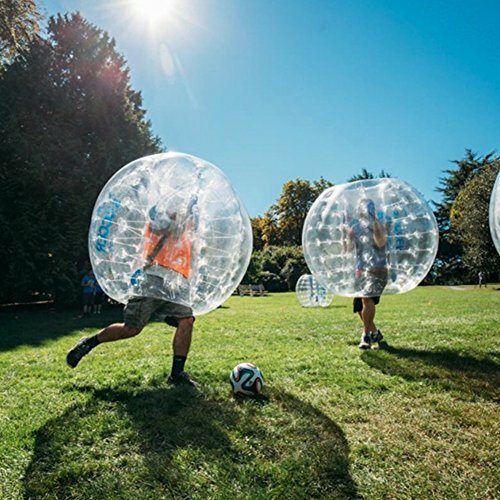 It is suitable for schools, leisure centers, parks, rental business; the bubble ball is perfect for family get together, birthday bash, end of season party, social sports gathering, bachelor party, and bachelorette party. You and your friends will be laughing for days after. Bumper ball fits kids ages 6 and up, suitable for people office workers, students or outdoor enthusiasts. These giant wearable inflatable balls are sure to get your kids off the couch and put down the tv remote and their electronic devices. It is easy to inflate or deflate the bumper ball with electric air pump(not included), about 30 seconds. Transparent material keeps you cooler in direct sunlight and is easier to see through when playing sports. If you have any questions about this product by MAARYEE, contact us by completing and submitting the form below. If you are looking for a specif part number, please include it with your message.